Help us protect Amberley Church Tower, our beautiful Grade I listed building in West Sussex. Welcome to St Michael’s Church, in the heart of Amberley. Largest of four churches serving the Wildbrooks Benefice of West Sussex. The church tower currently needs substantial remedial work. The problems are such that our beautiful Grade I listed building has been added to the Heritage at Risk Register, as being in 'poor' condition by Historic England. The works necessary will cost well over two hundred thousand pounds. We have been raising funds via events, donations, Sussex Historic Churches Trust, the Headley Trust, and most importantly the Heritage Lottery Fund. So far we have raised over £172,000 but we have some way to go. Our worship reflects the old and the new. We celebrate communion with the modern wording three Sundays a month and use the Book of Common Prayer for other services. Problems with the church tower are such that our beautiful Grade I listed building has been added to the Heritage at Risk Register, as being in “poor” condition. 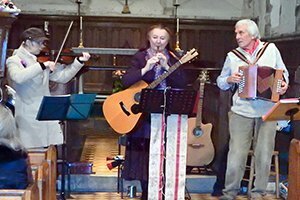 Keep up to date with events and fundraising updates for ACTnow Amberley Church Tower appeal, plus other parish news.